Oh, yea. 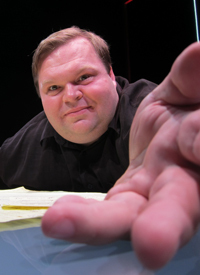 Today I purchased my ticket for Mike Daisey's 24-hour monologue (a part of TBA:11). I am so excited. This is going to be an awesome experience - and I am in for the whole 24 hours. A live, 24-hour monologue that spans the globe, weaving together stories from every time zone into an electric road movie for our time. All Pass Holders, besides Patron Pass holders, must purchase a ticket.